Kesar Elaichi Ice-Cream is so delectable that it always leave the guest wanting for more. 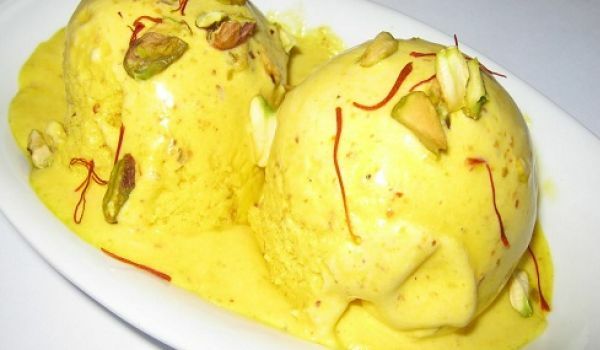 Learn how to make/prepare Kesar Elaichi Ice-Cream by following this easy recipe. Take a bowl and mix a cup of milk, milk powder and corn flour in it, to make a smooth paste. Take 2 tbsp of milk in a cup and put saffron strands in it. Keep it aside. In a pan, add sugar, saffron and cardamom powder, along with a cup of milk and bring it to boil. Now, cook it on simmer for 5 to 7 minutes and add the milk mixture prepared earlier. Stir it occasionally. Cook it till the mixture starts coating the back of the spoon. Remove from flame and allow it cool completely. Add cream to the prepared mixture and mix well. Pour this mixture in a shallow container, cover and freeze it, till it gets set. Bring this mixture out of the freezer, divide into two batches and churn it using a blender, until it gets smooth. Again, transfer the ice cream mixture in the shallow container and freeze till it is firm. Scoop it out in ice cream bowls and serve chilled.